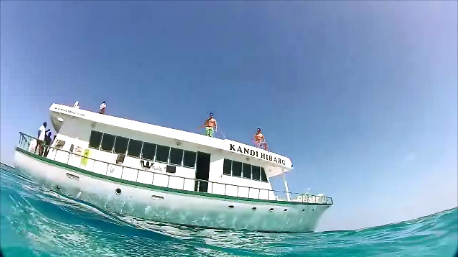 The best way to explore the waves in the Maldives. 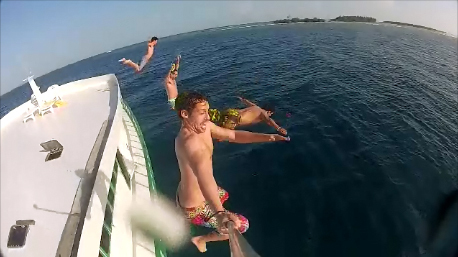 Surfinn Charter Maldives offers the most competitive prices for all Inclusive surf trips! 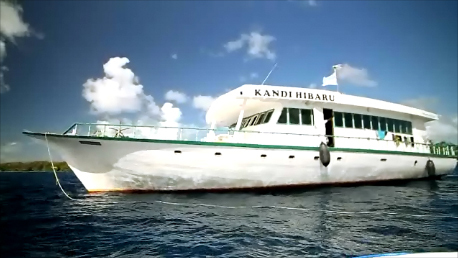 Available trips to Male Atolls, Central Atolls and South Atolls. Fully equipped boat with all the comfort and facilities for a maximum of 12 persons. Itinerary: starting from Male and arriving to Laamu airport (surfing along the way in South Male Atoll, Meemu Atoll, and all spots in Laamu Atoll). Return flight from Laamu to Malé is INCLUDED! Itinerary: starting from Male and arriving to Gaafu Dhaalu Atoll airport (surfing along the way in South Male Atoll, Meemu Atoll, Laamu Atoll, and all spots in Gaafu Dhaalu Atoll). Return flight from Gaafu Dhaalu to Malé is INCLUDED! Beach Distance It is a boat! 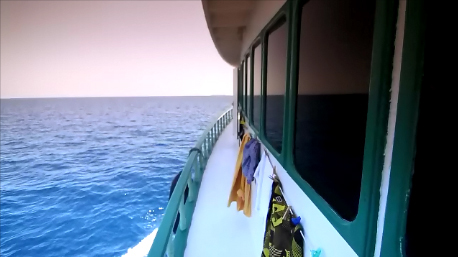 Surfinn Charter Maldives is more than a surf boat, it is your home away from home, offering great conditions and comfort for the best surf holidays in the Maldives, a place you will want to remember for ever! 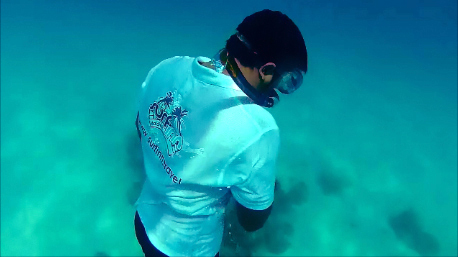 Our crew will take care of you so that you concentrate in relaxing and surfing in the Maldives! 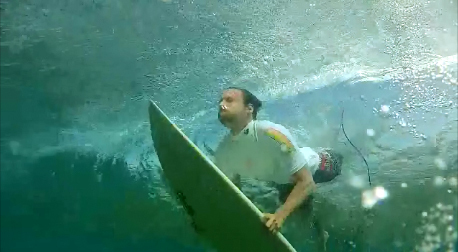 Our captain with more than 30 years of experience in the Maldives will take you to the best waves! One week all inclusive surf package in the Maldives is a life time experience that you will never forget. 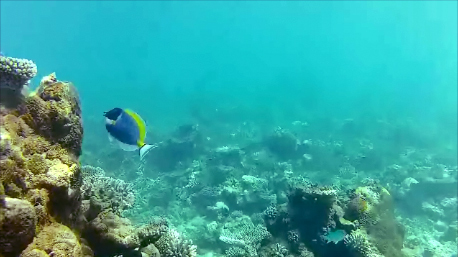 The further you go from the capital Male, the more unknown and wild the Maldives get. The real adventure in desert islands, sunset barbecues in sand banks, diving with mantas and whale-sharks, multicolor fishes, surfing secret spots… It’s not a dream, it’s right here! 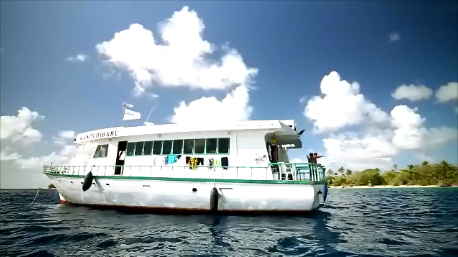 Surfinn Charter Maldives is the ideal boat for a surf trip to the Maldives. Our live aboard is fully equipped with all the facilities and conditions you need for several days out in the sea searching for some of the best waves on the planet. 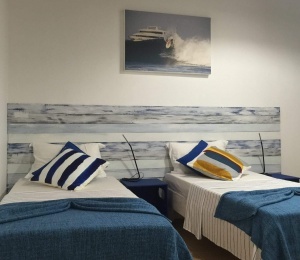 Featuring 6 double cabins for up to 12 people or more (in case of couples with children). All rooms have Ar Conditioning and private bathroom with hot & cold water. 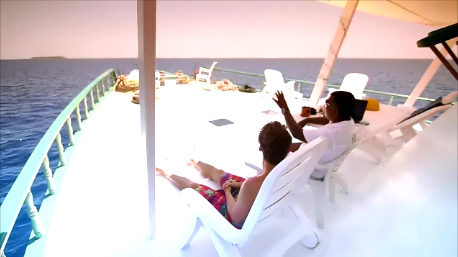 Living area with satellite TV, Internet on request, CD player, sound system and onboard DVD’s. All inclusive meals are included and will be served in the front deck with open views over the paradise desert Islands and resorts. The Maldives are the perfect surf trip for intermediate and advanced surfers. The Central and South Atolls still have plenty of waves to be discovered. Here you can feel the genuine feeling of discovery, surfing perfect waves with no crowd in the water. Just you and your friends in the Maldives! Expect nothing but small to big hollow barrels and long fun waves all along the trip! 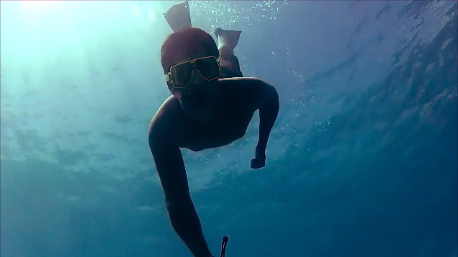 Good fitness conditions are required because you might end up surfing 3 or 4 times a day over shallow coral reefs that are not dangerous as long as you don’t dive with your head first. The South atolls have a few more right handers than lefts due to the dominant winds and currents. You will also discover why the Maldives is on the top 5 destinations in the world for diving. 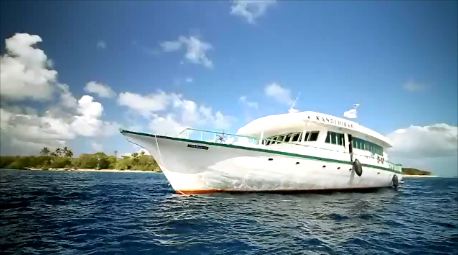 The Surfinn Charter Maldives is a surf boat with 72 ft (22 metres) and reaches a cruising speed of 10 knots. Surfinn Charter Maldives has 6 double cabins accommodating up to 12 people or more (in case of couples with one child). All rooms have AC and private bathroom with hot & cold water showers. The surf charter has a crew of 5 people, led by the captain with more than 30 years of Surf Trips in the Maldives, two deckhands, a cook and waiter. 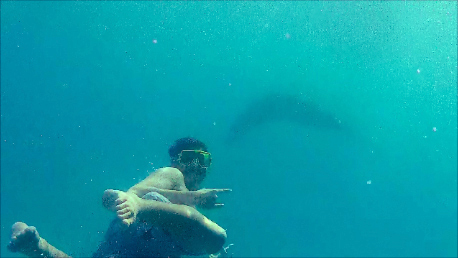 The Surfinn crew is super friendly and happy to take you to the best surfing spots along the surf trip. You can choose between 3 main itineraries (Male Atolls, Central Atolls and South Atolls) but we are completely flexible to arrange the itinerary you want! Our “dinghy” - a smaller boat - will take you directly to the lineup, so that you don’t need to paddle out. The “dinghy” is at your service, ready to go in & out whenever our guests want to get some waves or move to another spot. Dinner is provided in the front deck open area under shade or inside the lounge. As you know the Maldives is a Muslim country which means that the consumption of alcohol is only allowed in some resorts. Surfinn Charter Maldives has alcohol license on board, but it is only available on request. Please get in contact after your booking to get the list of drinks and prices. 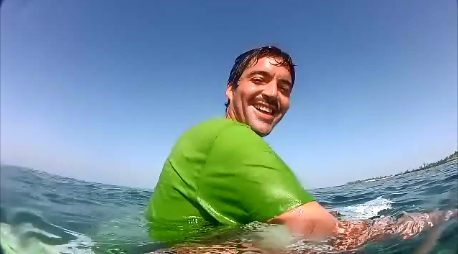 Apart from the best surf spots, we will take to desert islands, and prepare a unique BBQ and breakfast. Surfinn Charter Maldives also stops in some of the most remote islands for visits to local fishing villages which will make your trip remarkable. 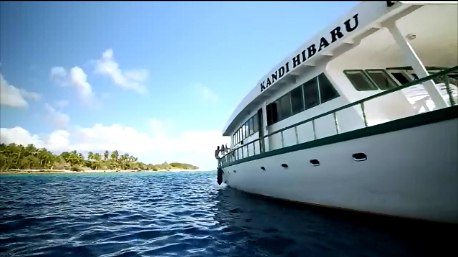 Also complimentary you will find on board snorkeling and fishing gear for the relaxing moments. We definitely recommend the night fishing! Besides all this, just let us know what you would like to include on your surf trip. Taylor made surf trips is our best! Every time you stop please don’t forget to take with you a plastic bag so that you can collect and bring any garbage you may find on the islands. As you know the Maldives has a sensitive ecossistem and unfortunately due to sea currents a lot of plastic bottles and cans arrive to its shores. Make your presence count and contribute to Surfinn Environmental Policy! Most Europeans are advised to bring electricity adapters as the boat uses 220V/50Hz British sockets. If you still haven’t decided on your surf trip to the Maldives, then Surfinn Surf Camps advises you to look and compare carefully all the offers. You’ll find out that this is the best offer in the entire Maldives! 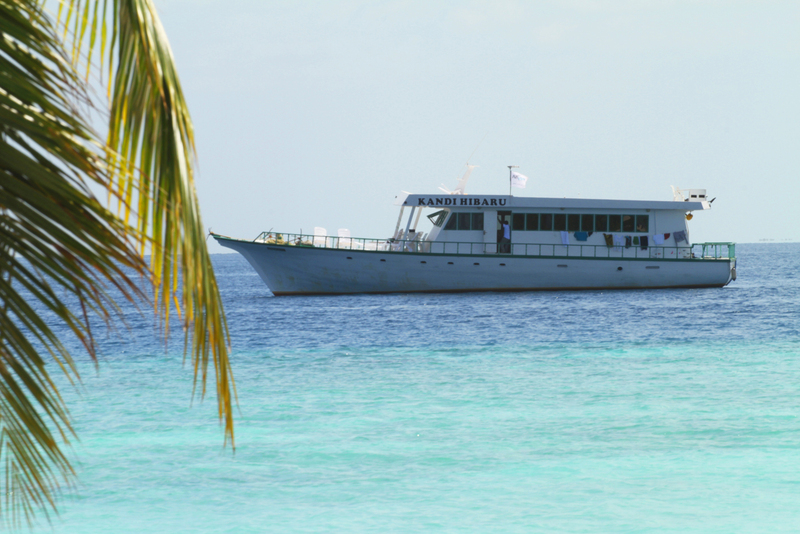 Please note that Surfinn Charter Maldives easily gets fully booked between April to October. Hurry up in your reservation! The Maldives has some of the best waves in the world. It can not be considered super powerful as the swell normally reaches shoulder to head high but offers big chances of barrel and long funny waves all along the trip! No doubt the perfect trip for intermediate and advanced surfers. There are some great surfing spots in the Maldives, but just a few are easily accessible from resorts. The best breaks are on the outer reefs on the southeast sides of the atolls. Most of the spots are very close to each other, so finding good surf is easy. Prepare yourself for surfing a few times a day at least. This country has 1,192 islands and endless surf breaks. 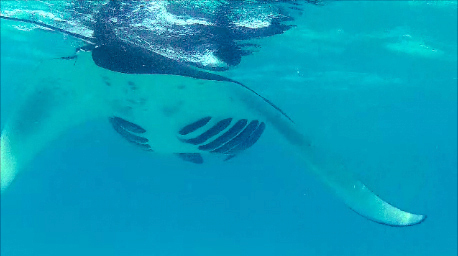 Some of them are nameless and yet to be found especially in Central and South Atolls. The best thing about the boat trip in the Maldives is the feeling of discovery, surfing perfect waves with no crowd in the water. Just you and your friends! Please note that you can only have this experience in Central and South Atolls. Male Atolls can be quite crowded, especially between May and August. 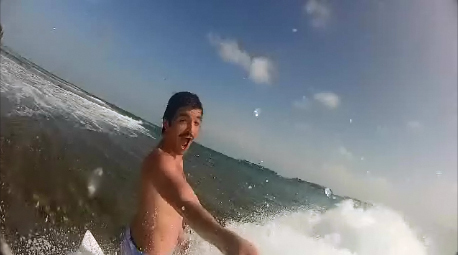 Our experienced captain knows exactly where the best waves are. Just trust us and come aboard! The surfing season in the Maldives depends on the Atolls but most of the archipelago is favourable for surfing from May until November, yet March and April are also good and have the best weather. In between surf sessions or sometimes when the swell does not show up you will have the chance to fish, snorkel or rest in the sun deck. SURFINN © 20-04-2019 12:42:17. ALL RIGHTS RESERVED.